What is an Amorphous Solid? An amorphous solid has the random internal structure of a liquid. A crystalline solid, in contrast to an amorphous solid, possesses an ordered, periodic internal structure forming a latticework. Usually, if you cool a liquid it solidifies into a crystalline structure. However, if cooling is very rapid then the liquid solidifies without forming any crystalline structure. This is true for liquid (melted) multi-component metallic alloys (alloys which include two or more kinds of atoms). Amorphous metallic alloys, often referred to as metallic glasses, are relatively new materials, mainly available in the form of thin ribbons. They are prepared from molten metallic alloys by a rapid cooling technique. In this technique a ribbon of molten metallic alloy is poured onto a rapidly rotating copper drum. Due to the thinness of the ribbon 20 to 30 microns, it cools very quickly (at a rate of about 1,000,000 degrees/second). Since solidification occurs so quickly, no crystalline structure has any chance of forming. Instead, an amorphous solid, in the form of a very thin ribbon, is created (the width varies from a few millimeters to 10cm. Obviously, the lack of any crystalline structure in amorphous ribbons is special. However, other properties of the material are affected by this lack of crystalline structures. The boundaries between crystals in crystalline solids typically cause most of the material’s faults. The homogeneous, non-boundary structure of amorphous metallic alloys provides unique mechanical, anti-corrosion, wear resistant, and magnetic properties. It makes amorphous metallic alloys superior in many ways to the more common crystalline metals. Why is AHT Amorphous Ribbon an excellent heating element for moderate temperature heaters? Due to the absence of crystalline structure, amorphous ribbons have higher electrical resistance than crystalline solids of the same composition. Together with the physical form of the ribbon, which provides a low mass to surface area ratio, it makes the ribbon a very attractive candidate as a heating element. Why? The explanation is very simple: energy transfer from any heating element is proportional to its surface area and the temperature difference between the heater and its environment. The larger the surface area, the lower the temperature difference needed to transfer energy from the heater to its environment. Since the surface area of the ribbon is relatively large (compared with the surface area of conventional heating wires) it is able to efficiently transfer heat to its environment at lower temperatures. In a domestic heating environment, lower temperature means a healthier environment and greater safety and durability. What’s unique about AHT Amorphous Ribbons? How easy is the system installation? AHT heating mats are extremely simple to install. 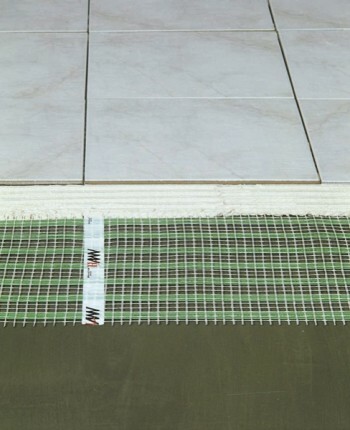 In the case of installation under tiles the heating mats are simply laid directly between the sub-floor and tile. The same materials used for laying tiles are used for bonding the electric radiant heating mats to your sub-floor. In the case of installation under timber, parquet or carpet floors, the installer lays the heating mats on the sub-floor, covers them with ¼ inch (6mm) self-leveling compound and then lays the flooring material directly on top. A certified electrician can complete the connection between the heating mats and the electrical circuit. No time-consuming calculations, labour or additional materials are required. How efficient are the heating mats under wooden or carpeted floors? Because AHT heating mats are constructed of ultra-thin amorphous ribbon – 25 microns – heat is not absorbed by the metal. It is therefore immediately transferred to the floor area and the ribbon temperature remains relatively low at around 28-30º C. This attribute is crucial under wood and carpet installations which can be easily damaged by higher temperatures. What are the safety measures against electrical shock hazard? The performance of the electrical resistance of the AHT ribbon coating has been given the necessary importance and therefore our product is certified in class 2, double insulation product. As such it has been tested and found to comply with safety standard IEC/EN 60335-2-96:2002 and IEC 60335-1:2001/EN 60335-1:2002 to withstand 3000 volts for 1 minute. This means that the product has sufficient electrical resistance according to the strictest standards. Also each unit is tested in the production line for electric withstand of 3000 volts, again- according to the relevant IEC standards for unit inspections in the production line. The electric withstand testing is repeated on each unit after installation using a Megger tester, and the measured resistance value is recorded on the warranty card. Why are certain other under floor heating elements (mainly heating wires) constructed with a metallic sheath or shield around the heating element, while AHT heating elements are not? The fact is that the additional metallic shield is not a significant factor in the prevention of electrical shock hazard. The risk at issue is someone inadvertently punching a metallic object like a nail or needle through the floor covering (carpet or timber) and into the electricity carrying metallic heating ribbon. The resulting physical effects on the person will be similar to the effects created by sticking the same object into a common electrical socket in the house. In the latter case there is no other way to protect the person from a shock hazard except by using a RCD (Residual current device). All under floor heating mats need to be connected to a RCD which is an integral part of our thermostats line. This is the reason why all the applicable standards, codes and practices require the mandatory incorporation of a RCD in the electrical circuitry of an electrical under-floor heating system, while leaving the alternative of including a metallic shield around the heating element as a design consideration for the element manufacturer. Note that most heating wire manufacturers include metallic shield for mechanical strength considerations for more than safety reasons. AHT flat ribbon has an inherent strength (because of the flatness and the large horizontal cross section) so that metallic strengthening is not required. What are the recommended RCD characteristics to be used with the system? Ensure that the electric circuit that supplies electricity to the under floor heating system is equipped with a 30 mA Residual Current Device (RCD). 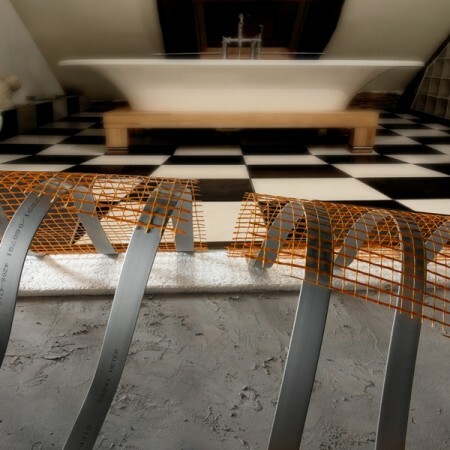 Why are AHT mats of special interest for underfloor heating? Efficient heat transfer because of the large surface area and the ultra-thinness of the ribbons that prevents heat absorption by the metal. They eliminate risk, never heating too much to change the characteristic of the metal. Low heating inertia because of the low mass of the ribbon. Especially in a more rapidly fluctuating (on/off) mode, you can expect energy savings due to both low heating inertia and efficient heat transfer. Possibility of using cheaper/less insulating material because of the lower heating temperature used. Very convenient physical shape, allowing fast and easy installation. Higher reliability because of the low heating temperature, high mechanical strength and corrosion resistance properties.